Completely natural, made from plants and with no synthetic vitamin C. It is a potent selection of plant polyphenols with HI-ORAC Plant extracts. Vibrant Health Super Natural Vitamin C complex is completely natural, made from plants and with no synthetic vitamin C. It is a potent selection of plant polyphenols with HI-ORAC Plant extracts. 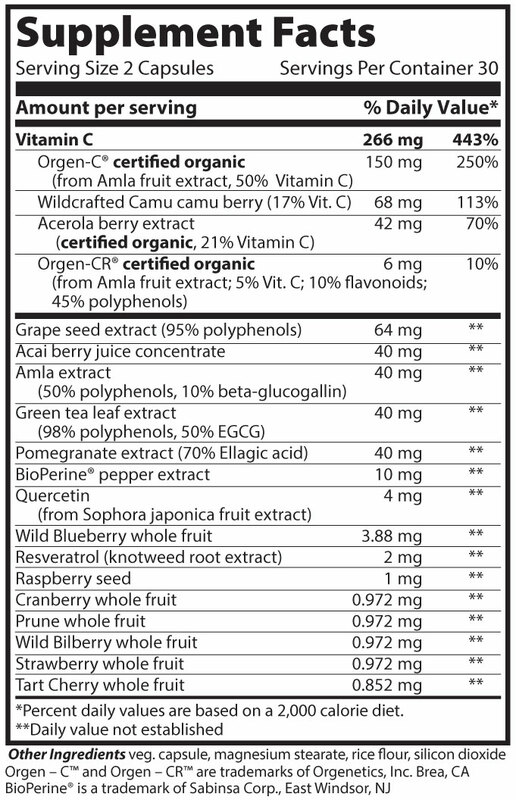 The perfect step up from plain Vitamin C supplements, grape seed extract or pine bark extract. This is top level polyphenol nutrition. Most vitamin C supplements are made with ascorbic acid Vitamin C, that is, vitamin C synthesized from GMO corn sugar? Even though it fits the strictly defined molecular structure of Vitamin C, it is really not the form encountered in food. 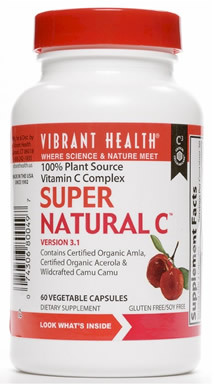 In fact, some people are even allergic to synthetic vitamin C.
Vibrant Health's Super Natural Vitamin C takes advantage of recent developments in botanical research and development to combine high ORAC value plant extracts with natural vitamin C from certified organic Acerola berry, certified organic Amla and wild crafted Camu-camu extracts. The result is a 100% natural vitamin C from plant sources.